Download "Stevenson v. N.C. Dep t of Corr. NO. COA10-1169. 1. 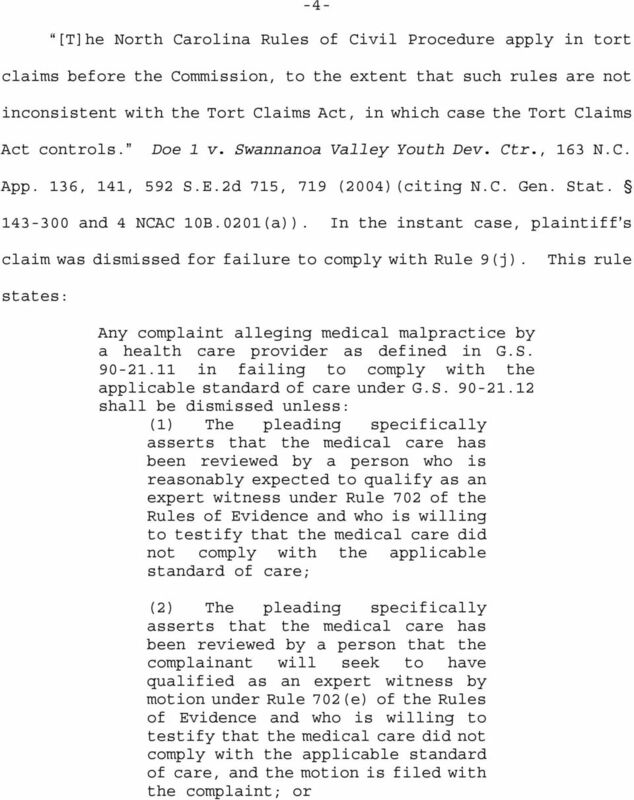 Medical Malpractice Tort Claims Act Rule 9(j) applicable"
1 Stevenson v. N.C. Dep t of Corr. NO. COA (Filed 15 March 2011) 1. Medical Malpractice Tort Claims Act Rule 9(j) applicable An inmate's allegation in a complaint under the Tort Claims Act that a physician's assistant failed to provide the appropriate standard of medical care fell squarely within the definition of a medical malpractice claim. Compliance with N.C.G.S. 1A-1, Rule 9(j) was required. 2. Medical Malpractice Rule 9(j) certification res ipsa loquitur not established Although a claim which fails to comply with N.C.G.S. 1A-1, Rule 9(j) may still be valid if it establishes negligence under res ipsa loquitur, plaintiff's allegation that a physician assistant's examination consisted of only a cursory glance was not the type of negligence a jury could infer through common knowledge and experience and plaintiff did not establish negligence through res ipsa loquitur. 3. Judgments clerical error remanded for correction A clerical error in a Tort Claims order was remanded for correction where the Industrial Commission concluded that plaintiff had complied with the special pleading requirements of Rule 9(j), even though it was clear from the context that the Commission had intended the opposite. 2 NO. COA NORTH CAROLINA COURT OF APPEALS Filed: 15 March 2011 ROGER STEVENSON, Plaintiff v. North Carolina Industrial Commission I.C. No. TA N.C. DEPARTMENT OF CORRECTION, Defendant Appeal by plaintiff from order entered 8 April 2010 by the North Carolina Industrial Commission. Heard in the Court of Appeals 23 February Roger Stevenson, pro se, for plaintiff-appellant. Attorney General Roy Cooper, by Associate Attorney General Christina S. Hayes, for defendant-appellee. CALABRIA, Judge. 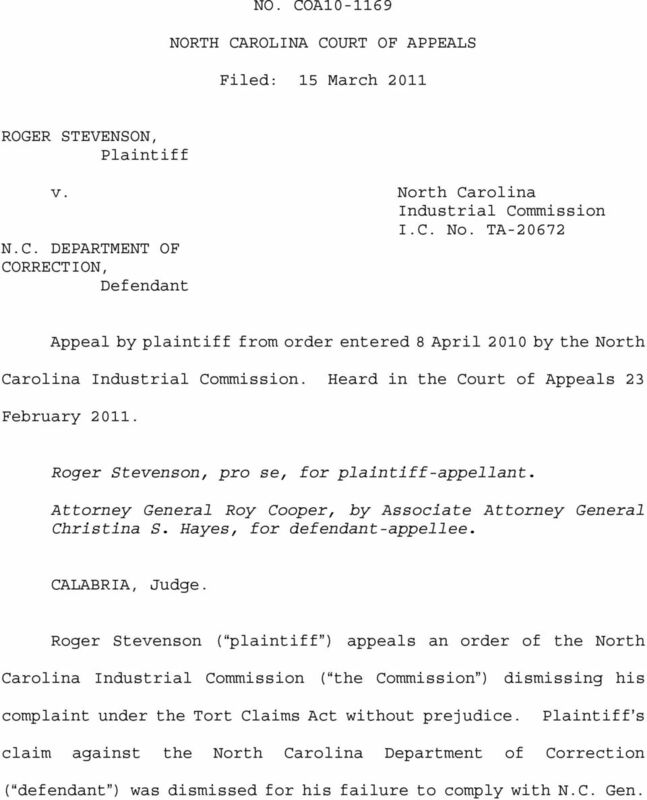 Roger Stevenson appeals an order of the North Carolina Industrial Commission (Athe dismissing his complaint under the Tort Claims Act without prejudice. 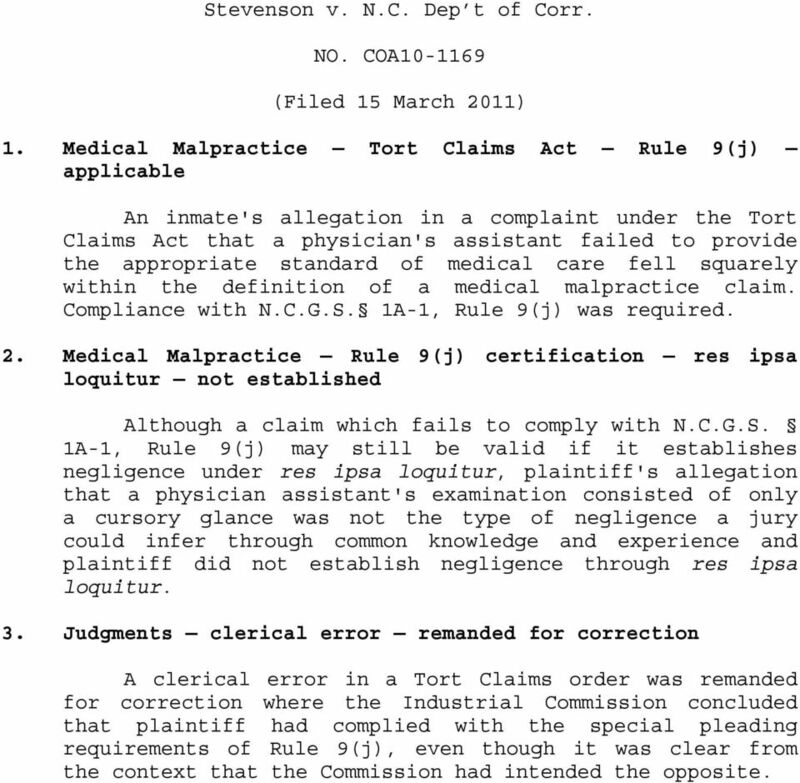 Plaintiff=s claim against the North Carolina Department of Correction was dismissed for his failure to comply with N.C. Gen.
3 -2- Stat. 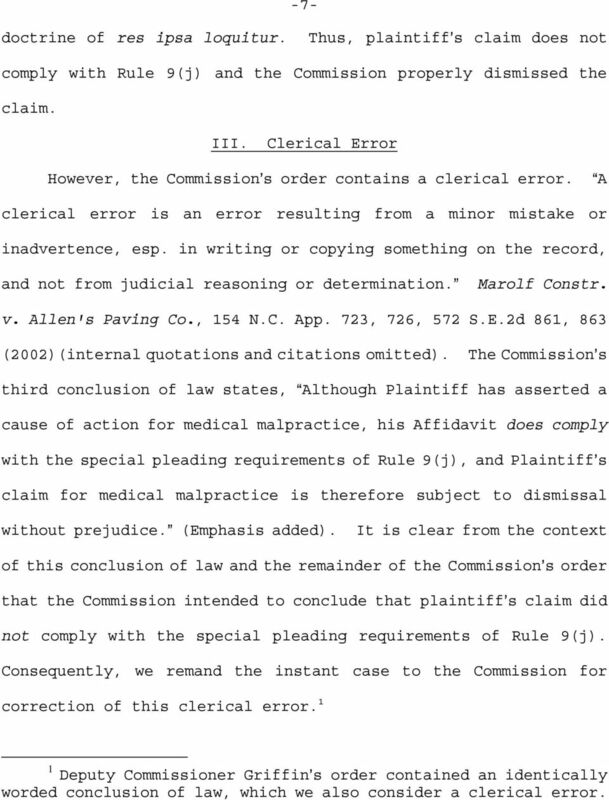 1A-1, Rule 9(j)(2009) (ARule We affirm and remand for correction of a clerical error. I. Background Plaintiff is an inmate at the Lanesboro Correctional Institute in Polkton, North Carolina. 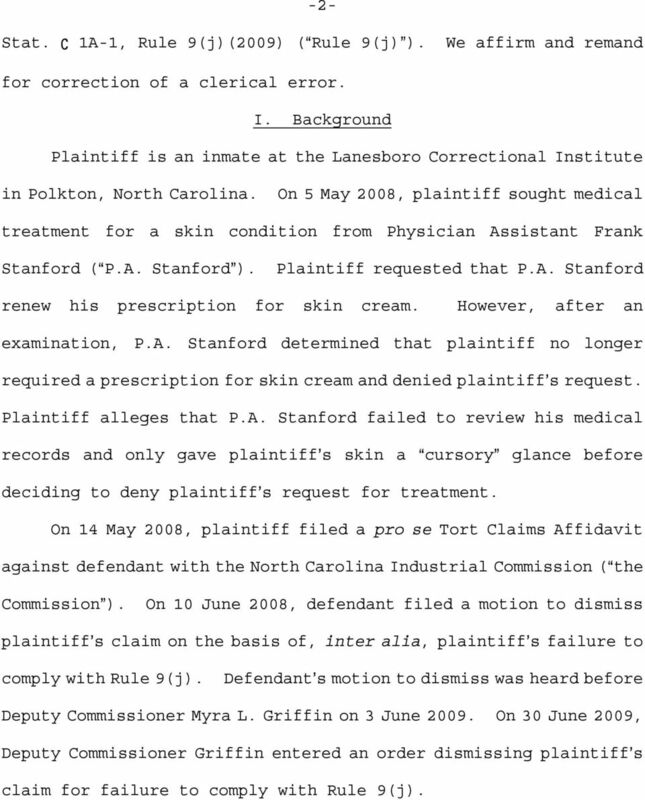 On 5 May 2008, plaintiff sought medical treatment for a skin condition from Physician Assistant Frank Stanford (AP.A. Plaintiff requested that P.A. Stanford renew his prescription for skin cream. However, after an examination, P.A. 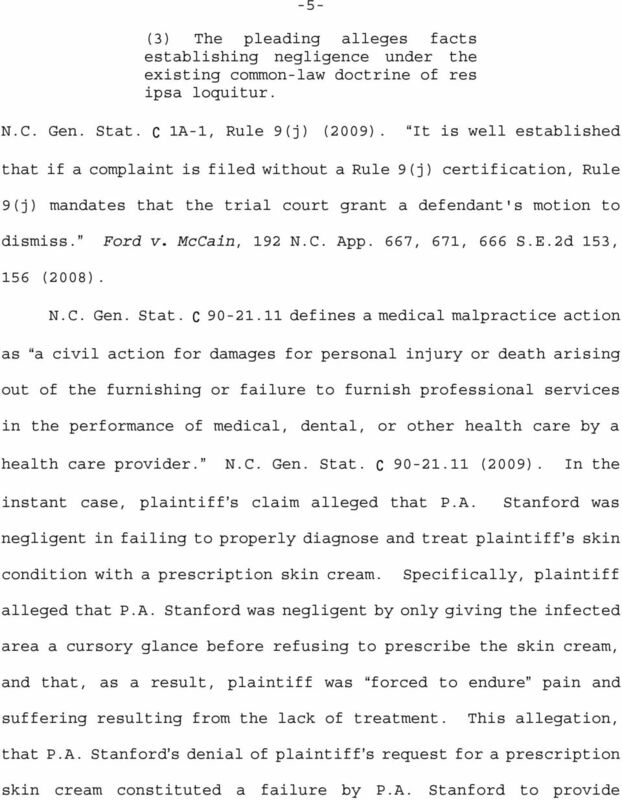 Stanford determined that plaintiff no longer required a prescription for skin cream and denied plaintiff=s request. Plaintiff alleges that P.A. 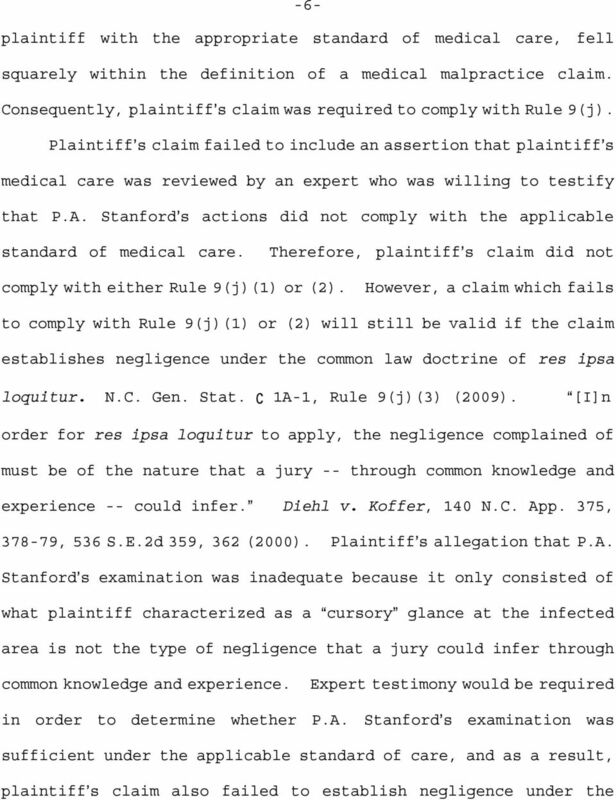 Stanford failed to review his medical records and only gave plaintiff=s skin a glance before deciding to deny plaintiff=s request for treatment. On 14 May 2008, plaintiff filed a pro se Tort Claims Affidavit against defendant with the North Carolina Industrial Commission (Athe On 10 June 2008, defendant filed a motion to dismiss plaintiff=s claim on the basis of, inter alia, plaintiff=s failure to comply with Rule 9(j). Defendant=s motion to dismiss was heard before Deputy Commissioner Myra L. Griffin on 3 June On 30 June 2009, Deputy Commissioner Griffin entered an order dismissing plaintiff=s claim for failure to comply with Rule 9(j). 4 -3- Plaintiff appealed to the Full Commission. On 8 April 2010, the Commission entered an order dismissing plaintiff=s claim without prejudice. The Commission=s order permitted plaintiff to re-file his claim with the required Rule 9(j) certification, so long as plaintiff re-filed his claim before the earlier of either (1) the expiration of the applicable statute of limitations or (2) one year after the entry of the Commission=s order. Plaintiff appeals. II. Rule 9(j) Under the Tort Claims Act, the Commission is Aconstituted a court for the purpose of hearing and passing upon tort claims against... all... departments, institutions and agencies of the N.C. Gen. Stat (a) (2009). 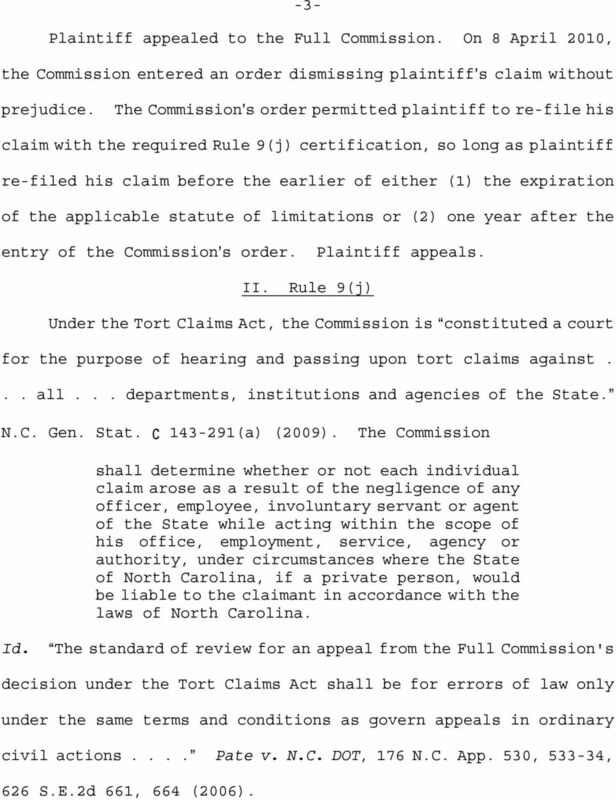 The Commission shall determine whether or not each individual claim arose as a result of the negligence of any officer, employee, involuntary servant or agent of the State while acting within the scope of his office, employment, service, agency or authority, under circumstances where the State of North Carolina, if a private person, would be liable to the claimant in accordance with the laws of North Carolina. Id. AThe standard of review for an appeal from the Full Commission's decision under the Tort Claims Act shall be for errors of law only under the same terms and conditions as govern appeals in ordinary civil Pate v. N.C. DOT, 176 N.C. App. 530, , 626 S.E.2d 661, 664 (2006). 8 -7- doctrine of res ipsa loquitur. Thus, plaintiff=s claim does not comply with Rule 9(j) and the Commission properly dismissed the claim. III. Clerical Error However, the Commission=s order contains a clerical error. AA clerical error is an error resulting from a minor mistake or inadvertence, esp. in writing or copying something on the record, and not from judicial reasoning or Marolf Constr. v. Allen's Paving Co., 154 N.C. App. 723, 726, 572 S.E.2d 861, 863 (2002)(internal quotations and citations omitted). The Commission=s third conclusion of law states, AAlthough Plaintiff has asserted a cause of action for medical malpractice, his Affidavit does comply with the special pleading requirements of Rule 9(j), and Plaintiff=s claim for medical malpractice is therefore subject to dismissal without (Emphasis added). It is clear from the context of this conclusion of law and the remainder of the Commission=s order that the Commission intended to conclude that plaintiff=s claim did not comply with the special pleading requirements of Rule 9(j). Consequently, we remand the instant case to the Commission for correction of this clerical error. 1 1 Deputy Commissioner Griffin=s order contained an identically worded conclusion of law, which we also consider a clerical error. 9 -8- IV. 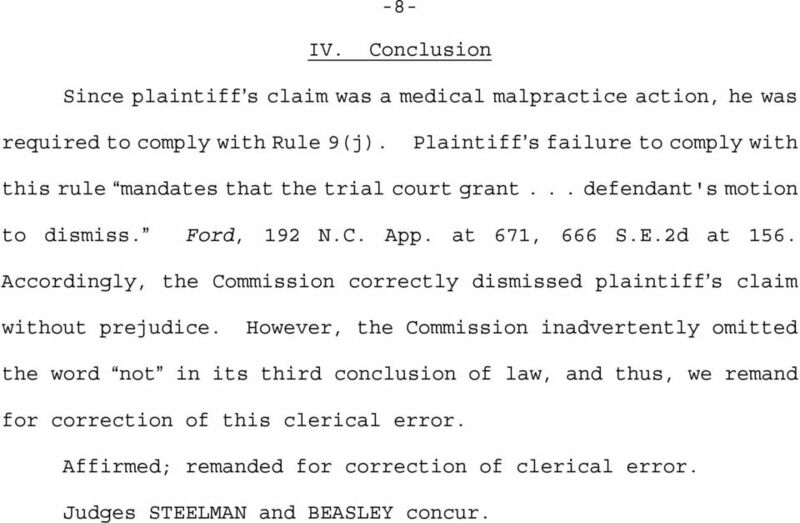 Conclusion Since plaintiff=s claim was a medical malpractice action, he was required to comply with Rule 9(j). Plaintiff=s failure to comply with this rule Amandates that the trial court grant... defendant's motion to Ford, 192 N.C. App. at 671, 666 S.E.2d at 156. Accordingly, the Commission correctly dismissed plaintiff=s claim without prejudice. However, the Commission inadvertently omitted the word in its third conclusion of law, and thus, we remand for correction of this clerical error. Affirmed; remanded for correction of clerical error. Judges STEELMAN and BEASLEY concur. NO. COA12-1496 NORTH CAROLINA COURT OF APPEALS. Filed: 5 November 2013. North Carolina Industrial Commission. PHILLIP OXENDINE, Plaintiff-Appellee, v. TWL, INC., Defendant- Appellee, and CANAL INSURANCE COMPANY, Defendant-Appellant NO.